if number 11 is number 40. 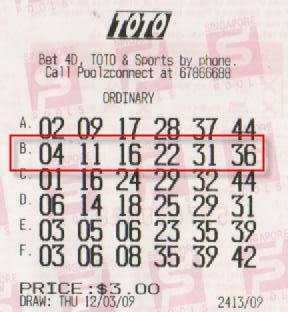 Our $3 TOTO pooling recently has make some break through by using our special winTOTO system in generating winning numbers. With this method, we should see a consistence win in the near future. Yesterday, one of the tickets almost hit the Group 1 prize as shown in the picture below. Congratulation to all our $3 pooling members. They all have the big share from the winning. You can be assure more bigger winning are on the way. For those that have not join this wonderful pooling scheme, you should click the below link and join the team as soon as possible.